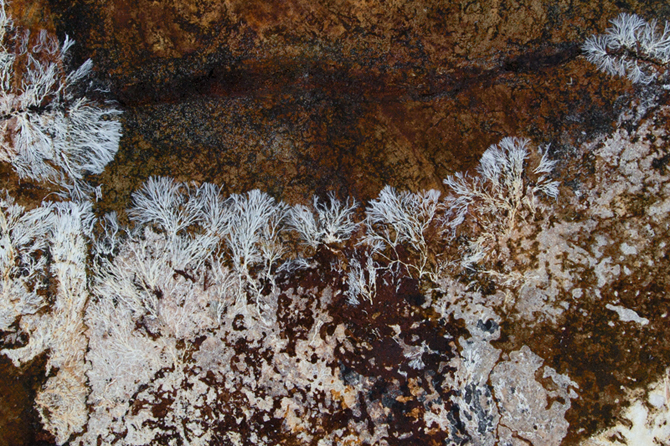 Driven by a fascination for natural processes, Markus Hoffmann enables spectators to experience natural phenomena that are usually withdrawn from our perception through the experience of his art. The 1982-born installation artist concerns himself with a range of highly ambivalent materials – such as fungi, exhaust fume or radioactive artefacts –, negotiating not only their controversial position in today's society, but also the paradox of their appearance's significance in an aesthetic, as opposed to an ethical context. The materials are attributed with a calm and strange beauty, a peculiar sublimity, forcing the perception to reconsider anticipated and precast sentiments. Markus' works thus pose urgent questions to society's consciousness and to art's fictive and supposedly innocent framework, offering a space of intense experience. Equipped with a distinct aesthetic language and with a high political potential, it doesn't come as a surprise that although Markus just completed his studies in the class of Olafur Eliasson at UDK Berlin, both his own and cooperative works (created with the collective DAS NUMEN) are already represented in international museums and other art institutions. 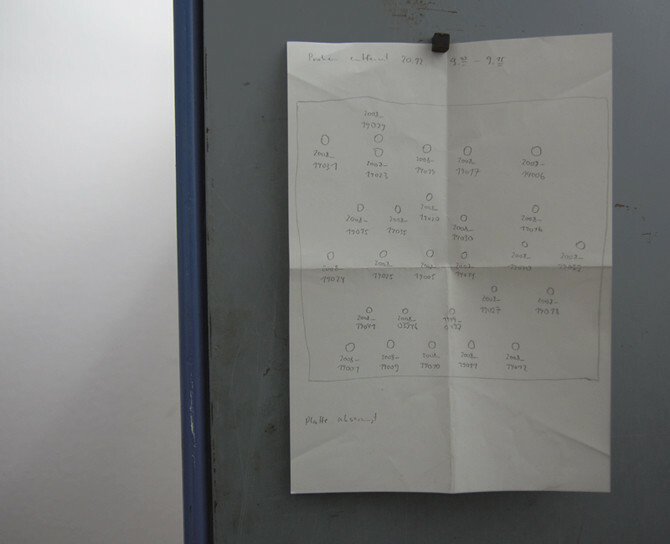 I met Markus in Berlin, where he lives and works, and talked to him about his choice of materials, about art and politics and about spectatorship. Anna-Lena Werner: Your work has many scientific features. Why didn't you become a chemist or a physicist? Markus Hoffmann: I think the production of art offers more possibilities that make me question what surrounds me. But I actually worked in the field of science before, studying medicine and art. This education gave me a lot of experience, now helping me to develop a language within different disciplines. Anna-Lena: What motivates you to do art? Markus: I hope that it enables me to make a contribution to reality. Establishing something unsecure – a site-specific comment. And it makes me think. Eventually, it makes sense to me to create something that could potentially make other people think, too. Anna-Lena: Do you think that art has the power to change reality? Markus: I believe that every reality is a construction, so that it can also be changed. Art offers the possibility to create a space, in which individual evaluation processes can be questioned far from social conventions. That is why I believe the effects of art are relevant, but of course, they don't always succeed. Anna-Lena: Many of your works involve radioactive material. Why did you start to work with it in the first place? Markus: I grew up on the countryside in Bavaria, where I often went to the forest to collect mushrooms with my grandmother. If I think about it today, there was something memorable about this activity, something strange. Although the collecting itself was a romantic experience, the mushrooms were assumed to be contaminated after radionuclides had rained down, caused by the previous catastrophe in Chernobyl. I think that ambivalence struck me and I still like this attribute about radioactivity today. It is there, but you cannot perceive it. From a temporal perspective, radioactive artefacts from our species are ”Future Fossils” – they should be regarded as the largest monuments in the world and they will continue to confront us with difficult questions. People tend to ignore that in daily life, although the consequences of our nuclear contributions are more than obvious and they are highly relevant. Markus: … but they are ugly at the same time. At least once you know what you are looking at. Seriousness and beauty do not necessarily have to exclude each other. Beauty might prevent spectators from having a defensive response towards negatively connoted topics at the first view. It is a subjective acknowledgement, but also a time-based convention. Anna-Lena: Do you have an inspiration for this bipolar proportion between beauty and ugliness? Markus: Nature is important to me. For example, I experienced the area around Chernobyl as beautiful: it is like a jungle with many wild animals. People barely interfere with nature, because they are afraid of staying there for too long. I saw a similar contradiction in a Chinese mining area, where quicksilver and other chemicals visibly contaminate the platform. It looks beautiful, the colours are great, but at the same time it is obviously not healthy. Yet, how do we determine what is natural and what is not? The human species is natural and human interventions in nature are, in a sense, too. 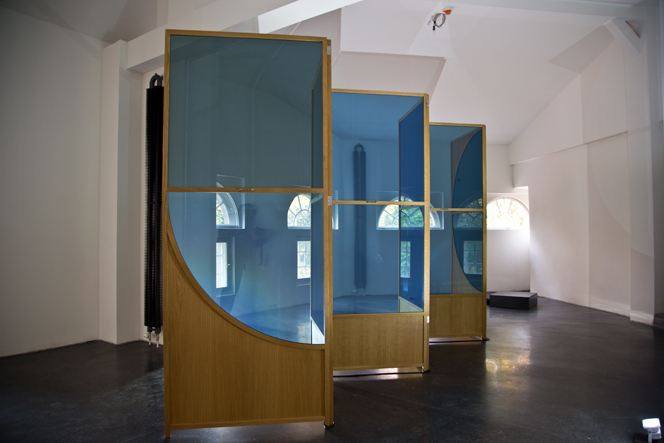 Anna-Lena: You recently presented the work UMKEHR (2014), which comprises radioactive material inside two rotating hourglasses that are connected to loudspeakers. Would you consider this object a micro-dystopia? Markus: The context is ambivalent, but not necessarily negative. It somehow marks the beginning of our nuclear age: The materials in the hourglasses are artefacts from the world's two first nuclear bomb tests. One comes from Semipalatinsk in Russia, one from the Trinity-Test site in New Mexico in the USA. During the nuclear tests, the sand at the sites was transformed into glass. First it was blown up and then it rained down, covering the ground. I asked myself how this might have sounded. I generally like the quality of the material. It has a similar potential as natural radioactive stones have it. Since stones are often used for sculpturing, I find it interesting to extend the notion of the sculpture to both its temporary and its radiating impact. 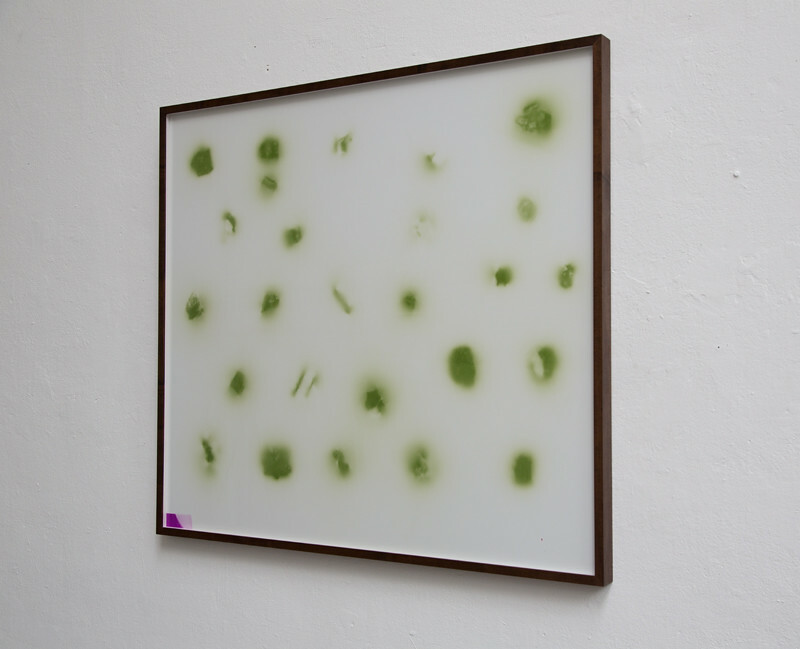 Anna-Lena: The potential that you are referring to is literally framed in your work ERZFELD (2014), which consists of papers that show green marks caused by stones containing uranium. How was this done? Markus: Technically speaking, the material is placed in a predefined pattern on a photosensitive layer, causing it to darken. The more it radiates, the larger the shadow on the paper. In that sense, it does not reflect the actual size of the stone, but rather the impact of the stones radioactive potential. Anna-Lena: How do you actually get a hold of radioactive stones? Markus: I cooperate with museums. Anna-Lena: Almost every work of yours showcases a procedural change. What interests you about the material’s indefiniteness? Markus: Its dynamic mode of actualisation – its ability to appear solid and immaterial at the same time. The viewers’ perception determines this relationship and I think the notion of constant change is similar to the human entity being a dynamic system itself. I would like to think that the visualisation of change creates the experience of a temporal sculpture. 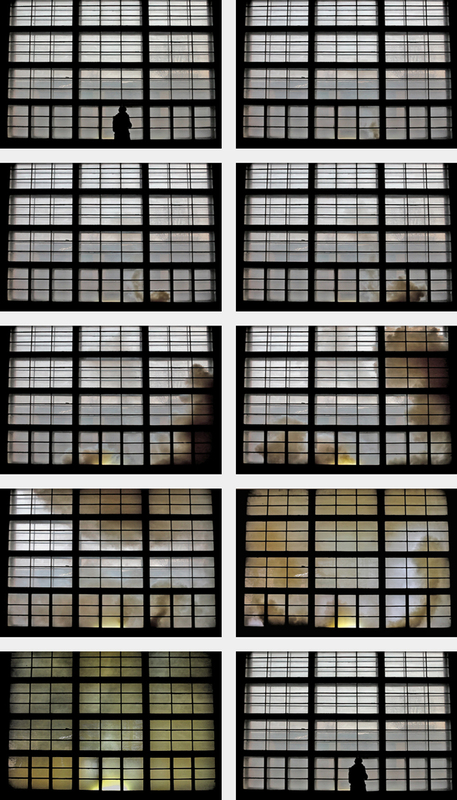 For example, in the work DENSITY (2011) I worked with smoke grenades, making small particles visible by presenting them in a condensed form inside a closed space. After all, I don't do so much – these things happen all the time. We just cannot see them. 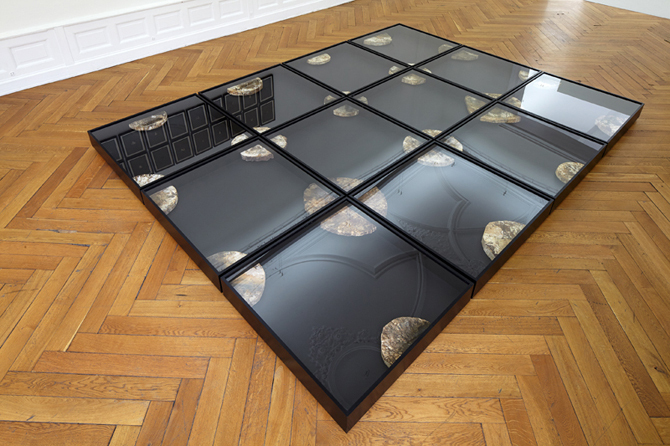 Anna-Lena: How did these thoughts on process influence your work MEMORY (2014), which consists of twelve vitrines accommodating tree discs from all continents of the globe? Markus: I had different mushrooms species grow and die off on the wood discs. This evoked a pattern to appear on the surface, bearing resemblance to painting. This pattern was controllable, but only in the sense that the mushrooms and I needed to cooperate. For me it was about the action of stopping and inducing – the mushrooms had their own agenda to unfold. The results show an accumulation of decisions over time. Anna-Lena: Do you consider your work political? Markus: I never see my work as being driven by a political agenda or as actively political in the first place. On the other hand: nothing is not political. 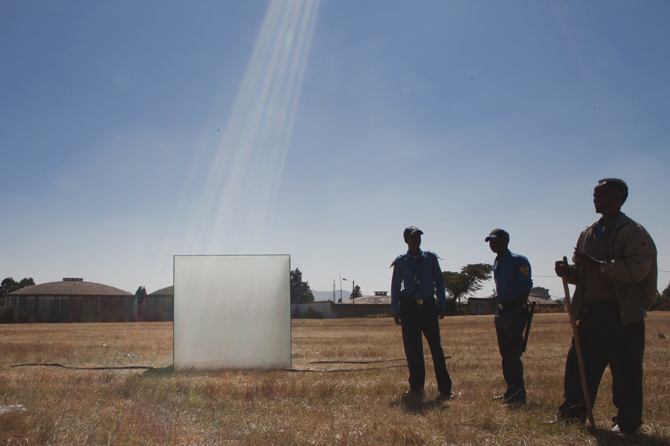 Anna-Lena: FUME (2012), which is a project you did in Ethiopia, showed a glass cube on a field. Four cabs approach it, the drivers attach tubes to the tail pipes and let the motor run, so that the cars' exhaust fumes are channelled into the glass box. Isn't that a political statement? 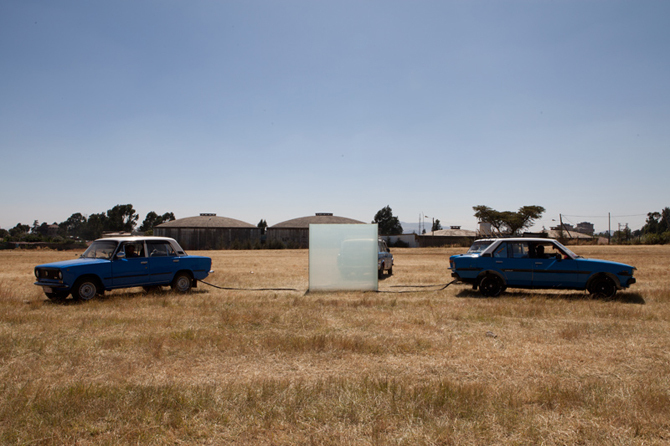 Markus: When I arrived in Addis Ababa, I recognised that the air smelled like gasoline – somehow oily. I imagined a microcosm, relocating and compressing the air of an entire city into a small cube. This is what happens in the glass cube. The particles are locked inside. First they remain in the air and then they tip. Anna-Lena: You make musical instruments respond to the spectators’ and the spaces’ radioactive history. How much does the visitors’ interaction with your works determine your practice? Markus: In some works, like SETONE (2010), my primary concern is the space in which I install the object. The interaction with visitors is an implicit outcome. I am interested in the situation, and in the viewer creating a temporal sculpture: The spectators’ conscious perception of the time they spend in the exhibition space. The perception of their own perception – trying to reach orientation and to comprehend what exactly it is they see or what they are exposed to. Anna-Lena: The spectators of your works probably also wish to comprehend what they see, because you never provide any printed texts for exhibitions. Why not? Markus: Of course there is a reason for the things that I do, but I would never legitimise a project through its background. I find it more beautiful when spectators approach a work unbiased, in order to generate their own narrative. The work does not exist without them. I prefer when people approach me, ask me questions or tell me their idea about my work. Their interpretation gives me the feeling that my work arrived somewhere, that it triggers something. Anna-Lena: But you cannot possibly be present at all your exhibitions? Markus: That is obviously not always possible. If it is in line with the budget, I employ people who answer all the questions that the spectators might have. The supervision of the work should come from spoken word, because it appreciates the spectator. Texts are good, but they evoke a predetermined experience provided by the written information. I think the authorship of experience should belong to the spectator.